Instead of going to the car wash, what if the car wash came to you? On top of that, what if that car wash didn’t need to use water? In Singapore, this seemingly futuristic option is now a realistic app. 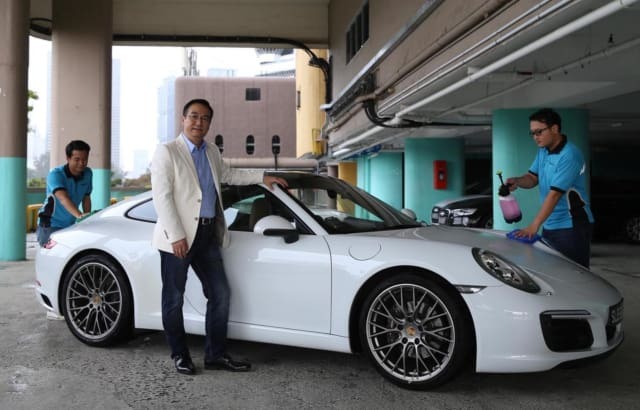 Dr. Joseph Sun founded EWash, an application-based mobile car wash service that uses a waterless car-washing solution. The solution, which he developed, has been approved by Singapore’s Housing and Development Board (HDB). An engineer, Sun applied his expertise to an overlooked issue: sometimes protecting an investment has hidden consequences. When that investment is a shiny new car or truck, the car wash may be a frequent destination, which results in a significant amount of wasted water. It’s estimated that a self-serve wash uses 17 to 18 gallons per car while an automated system uses around 40 gallons. His solution completely eliminates the wasted water factor. According to Sun, EWash has saved approximately 3 million gallons of water to date—the amount of water used in three Olympic-sized pools. Sun began exploring a solution to car wash waste in 2016. He developed more than 10 solutions before finally perfecting a pH-neutral, four-part solution. First, it includes a surfactant, common in detergents, that dissolves and clears away dirt particles. A lifting agent then turns those lifted dirt particles into liquid droplets for easy removal. The solution also includes a lubricant to prevent micro-scratches and a protective wax layer to reduce damage from UV light and other environmental damage. With his innovation solution in hand, Sun then turned to the contemporary trend of apps to create a mobile car wash service. Currently only available in Punggol and parts of Ang Mo Kio, Bukit Merah, Clementi, Jurong East, Sengkang, Toa Payoh and Yishun, EWash allows people to download the app and select services. Then, they get an in-app notification and a photo of the clean vehicle. While Sun’s solution is safe to touch and safe for vehicles—along with being easy and convenient—it is designed for Singapore’s tropical climate and low humidity levels. For people in the U.S. who experience a range of weather and humidity conditions, this solution may not be suitable. Nevertheless, this solution at least points to waterless car washes being a step closer to a global reality. Considering that less than 1 percent of water is available for human use, researchers are developing solutions to increase efficiency and conservation efforts. To learn more, check out Biomimicry-Inspired Surface Can Harvest Water from the Air and Denmark Pilots Water-Recycling Pavement.